Many couples decide to write their own wedding vows, finding this to be a personal and extra meaningful addition to their wedding ceremony instead of simply repeating after an officiant. If you think writing your own vows might be the right path for you, here are some steps to take to help you begin. When you decide to write your own vows, you’ll need to talk to the person who’s marrying you. This is because some religions require the wedding couple to actually say traditional vows. You can actually do both, but you should all be on the same page with the “rules” and how the wedding ceremony will need to go. When you have this discussion with your officiant, it’s a good idea to have your written vows ready to show him or her in case they need to look over them. When working on your wedding vows, there are some important questions to sort out beforehand. Will you and your fiancé write them together, or will you reveal what you’ve written at the ceremony? Will you “help” each other write them? How many words will you each have? You wouldn’t want your vows to be significantly shorter than your fiancé’s, or a completely different tone, so it may be good to ask each other a few questions if you don’t plan on working on them together. It’s good to get everything out on paper (or screen) and then edit. Write way more than you’ll need. Think about your relationship together, what makes you love each other, and use language that means the most to you. Think about memories, jokes, and your history. Think about how you met and your first kiss. Think about exactly what you want to say. Once you have too much, pare down. Whatever you do, do not wait until the last minute to write your wedding vows. As the wedding date comes closer, you’ll be more distracted, more stressed, and more overwhelmed. Adding the job of rushing to write your own wedding vows to this will not get a good result. 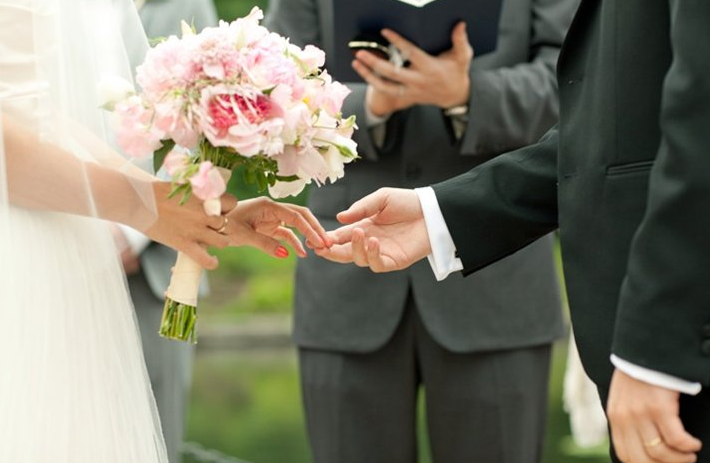 Start writing your vows months in advance, so that you can take your time with them, revise, and make them just right. Bridesmaids Gifts that They Will Love! …within reason. Don’t totally copy and paste someone else’s vows, but do look around and see what others have written to see what inspires you. It’s good to mix your own thoughts and message with someone else who may have written something meaningful to you that you wouldn’t have thought of, or can put something more elegantly than you can. Just be sure to stay true to your own voice and to say what you want. Some people can memorize the vows they’ve written. If this is you, congratulations! But if you aren’t a great memorizer—or are simply nervous that you’ll forget everything while standing in front of everyone—it’s completely fine to read your written wedding vows. However, it’s a good idea to practice reading them out loud while looking up every once in awhile. When reading such meaningful words to your future spouse, you’ll want to look them in the eyes a little! So practice reading, glancing, and reading. Good luck writing your own wedding vows! Hopefully this list will help you during the process. If you’re planning your wedding and are searching for a fantastic Los Angeles wedding venue for your big day, be sure to take a look at our photo gallery. We have a stunning space for weddings of all sizes. You can also feel free to contact us with any questions you have, or check our availability.